Psychiatrists are becoming increasingly aware that the mental illness of individuals implies a corresponding sickness of the group. The very fact that a mentally sick person has to seek the help of a doctor or hospital shows that the (family) group to which he belongs is decompensating and thus can no longer care for the patient from its own resources. The psychiatric patient cannot therefore be regarded as an isolated individual; he must rather be seen as the representative of a family or group connected with him in a variety of ways. If, therefore, we are attempting to treat a mental patient, we must place him in his own social context, and so select the appropriate therapy. Freud (1921) rightly said that the social environment becomes a part of the psychic life of the individual. But we know today that the system of communication in which a person is involved can never be ascertained from whatever image, ideal, or caricature he has formed in his own mind. In order to know someone we must know his (human) environment and his relationships with it. He can only be known for what he is in and with the group or groups, of which he is a part. He can judge himself only by the reactions of his group or groups, and without them his words and actions have no weight. Man’s deeds have no real existence except in the memory of the group. A word merely drops into the void unless there are people there to hear it. And nothing is more unbearable to man than to find himself in a void (Binswanger, 1942; von Gebsattel, 1959). Humans are so closely bound up with their environment that they cannot be considered without it (Lindemann, 1960). As it became more widely realized that if we are completely to understand a man his social milieu must be taken into account, the group, which had already played an important part in the healing process in past cultures, both advanced and primitive, was rediscovered as a therapeutic agent in the twentieth century. This led to the development of group psychotherapy, through which it became possible to place the mental patient in his own social dimension and treat him accordingly. A psychiatric hospital, in itself a microcosm, provides an ideal background for the study and therapeutic exploiting of social behavior and interaction, with the help of sociometric tests (Alnaes, 1963, Moreno, 1954, Friedemann, 1959). It is therefore to our advantage to make the hospital wards into therapeutic units. The participants gain by the direct influence of the group on individuals or of individuals on each other; in addition, group psychotherapy also works indirectly on the whole ward by creating an actively therapeutic atmosphere which affects every member. It is scarcely possible to give deep individual psychotherapy to every patient who enters a psychiatric hospital, but treatment in departmental units ensures at least a minimum of medical and psychotherapeutic attention. It is also desirable in a psychiatric hospital to constitute smaller groups, diagnostically more homogenous, with an average of six to eight patients, in which patients with fairly similar illnesses and problems can work towards a solution of their difficulties through reciprocal influence and support. In the psychiatric hospital of the University of Basle, in certain departments we considered suitable, we have been holding group psychotherapeutic sessions since 1955 with all patients who wished to take part. Since 1957 we have also been working with small groups of patients, diagnostically more homogeneous. We made no plan as to which types of illness were to be specially considered; we simply grouped together those patients who had been hospitalized in large numbers in our clinic and with whom additional collective treatment gave promise of deeper understanding and a better therapeutic result. We moved only gradually towards group psychotherapeutic work with the most diverse diagnostic categories. Since mental illnesses are rooted in the patients’ human environment, it is reasonable from a therapeutic point of view to include patients’ relatives in the groups. It is thus possible to become better acquainted with the family groups, which have left their mark on the patients, and thus with the formative influences on their characters (Toman, 1963). But above all we can influence the patients’ environment and give them more emotional scope and freedom within their own milieu. In our hospital, as in other psychiatric hospitals (Boenheim, 1963), it is also clear that group treatment, like every kind of psychotherapy, becomes more difficult if the nursing staff does not have its part in the program. Nurses often do not instinctively understand the psychological and sociodynamic laws that operate in the wards, and they cannot approach objectively the patients’ behavioral tendencies—their transferences, resistances, and regressions. Therefore, in 1957, we began group work in our nursing school. In 1959 the hospital administration (Kielholz) also began to give the various categories of nursing staff the opportunity of a few hours’ free discussion in groups in annual refresher courses. In the spring of 1962 we began to organize analytical training groups for hospital doctors, in which they can work through the more-or-less conscious conflicts activated in them by the therapeutic groups and experience first hand the processes that take place in a collective body. The development of group psychotherapy has been helped in the last few years by the increasing concern of psychiatrists to give the patient himself some responsibility for his cure. Naturally, however, we would not expect an endogenous depressive with corresponding anxiety and psychomotor inhibition or agitation to make the effort to take part; such behavior on the doctor’s part would drive a patient suffering from melancholia to desperation or even suicide (Kielholz, 1959, 1961). We are thinking, for example, of neurotic and psychopathic patients, alcoholics and drug addicts, and also of epileptics or schizophrenics, in whom the assumption of at least a certain degree of responsibility provides a stimulus to face up to social reality, to stick to a long-term medication routine, or to conquer an addiction. In this connection we should mention the observations of Napolitani (1961). He gave schizophrenics considerable independence and saw that they were not only more able to cope with reality outside the hospital, but more quickly became capable of overcoming difficulties. This “community therapy” is unique and individual; it should not be thought of in group psychotherapy. Most particularly, the collective psychotherapeutic sessions take on a considerable importance for the functioning of the wards, since the patients help and support each other by working through such difficulties, problems, and tensions as may arise. Events follow substantially the same pattern in every therapeutic group, regardless of the culture, character, and intelligence of the participants. For instance, an almost identical struggle for hierarchical position occurs more or less openly in every group. Some push their way “upwards” almost compulsively; some, almost equally automatically, take the lower positions. These rules apply more or less independently of the type of individuals forming the group; thus it is hard to understand why different authors use different methods for group psychotherapy. At the same time it is clearly an advantage if the therapist can take into account certain particular features of the participants or local peculiarities. And every therapist will give preference to those techniques in which he is particularly interested. In our hospital two essentially different methods of group psychotherapy are used: (1) group psychotherapy with diagnostically heterogeneous wards (large groups); (2) group psychotherapy with small groups, diagnostically homogeneous. In the following sections we shall discuss the special characteristics and the techniques appropriate to each. If the treatment in a psychiatric hospital is to be as comprehensive as possible, it is essential to create a therapeutically active atmosphere; we should, therefore, consider the wards as units from the point of view of group therapy. While single patients are treated by somatic methods or individual psychotherapy, group psychotherapy with the patients of a ward leads to the integration of individual treatment methods in a psychotherapeutic plan that includes both individual cases and the ward as a whole. The special aspects of every case are firmly kept in mind, but the patients are centered on the group, and this forms a unifying bond that lifts the different patients out of their self-imposed isolation. Individuals feel less at a disadvantage with regard to fellow patients who are undergoing a different course ‘of treatment and find it easier to tolerate a treatment when others are having it at the same time. Group therapy involving a whole ward results in a psychotherapeutically active atmosphere in which patients feel themselves accepted with all their conflicts and can thus gain confidence. Although Johnson (1963) describes group work with a whole ward not as “group therapy” but as “group activity,” we feel that the size of the group has no bearing on its effectiveness as therapy. It will as a rule be easier, of course, to do psychotherapeutic work with a small group. But the same pattern of events stands out, sometimes in the foreground and sometimes in the background, with every group, whatever its size. We have, therefore, no reason to say that this method of treatment is not group therapy. 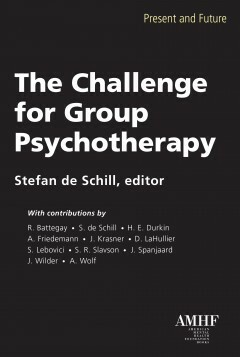 We also feel that the distinction made by many authors between group psychotherapy and group therapy is questionable, since not only the analytical, but also the directive method is accepted psychotherapeutic procedure. Before going into the characteristics of treatment in and with large groups, we should briefly indicate the technique we use. We carry out this type of group therapy with a women’s ward and a mixed private ward, each of which has twenty to twenty-five patients widely differing in psychiatric diagnoses. The sessions, which are held weekly, last one to one and one-half hours. These, naturally, are what are known as open groups, since patients are constantly leaving the ward or being admitted to it. At first we began by reading aloud a short story, usually a fairy tale lasting a few minutes. We chose stories that presented a problem that especially related to one or more patients. The patients were encouraged to discuss not so much the story itself as the emotions it brought to the surface in them. It was easier for the participants to express themselves, as they did not have to begin by speaking; the story was there to speak for them. We were using for these groups a principle similar to that of Moreno (1959) in his psychodrama, when he brought in the “auxiliary ego” to activate the problem in the patients and induce them to speak. The reading of the short story certainly stimulated the participants, but partly because this method obscured the therapeutic purpose of the sessions, and partly because they set up resistances against a deeper and more fundamental examination of their conflicts, they inevitably failed to penetrate beyond the superficial content of the story. The therapist was in danger of entering upon highly intellectual discussions, which largely left out of account the emotions behind the individual conflicts. Thus the reading of the story sometimes stood in the way of a deeper communal experience and the acquisition of new points of view. We changed, therefore, to letting the patients express themselves spontaneously; we simply told them they could, bring up anything about which they felt strongly. We also stressed the fact that the purpose of the meeting was not to have their questions answered by the therapist or to let him lead the discussion; the point of the sessions was rather that the patients should discuss their problems as freely as possible amongst themselves and thus gain fresh insight into certain inner conflicts and tensions. It must be constantly stressed at the beginning of the sessions that every individual member of the group must be able to count on the utmost secrecy. Since, as we have said, these groups are open, certain difficulties are bound to arise. The principles of group treatment must be constantly brought to the attention of the patients; and even so we cannot be sure that they will be observed. Indeed a good indication of the individual’s general attitude is his approach to these rules—whether, for example, he openly resists them or accepts them without question. It is important that the attitudes that come to light should be discussed by the members and constantly referred to. It goes without saying that these large groups also show the multiple and multidimensional transference patterns (Mullan & Rosenbaum, 1962; Slavson, 1951;. Stokvis, 1960, and others) and complex resistances that are characteristic of group dynamics. It is for the therapist to recognize these occurrences and try to sharpen the patient’s understanding of them. To begin with, the members of the group usually tend to expect the therapist to answer all their questions while they remain in an infantile passive role. They like to think of the doctor leading the group as a superior being whose words and actions can remove their suffering as though by magic. The feeling that the patients had about their parents in early childhood comes to life again in such a group and gives rise to regressive tendencies in the patients. With the therapist’s help they gradually reveal to the group the true background to their attitude, which makes it easier for them to become more independent and self-sufficient. A tendency to reciprocal identification (Slavson, 1964: identification transference) often becomes noticeable at a very early stage. If a participant expresses satisfaction with the doctors and the hospital as a whole, this circumstance, as a result of reciprocal identification tendencies, often has a very favorable effect on the whole ward by increasing confidence. Naturally, however, the participants can also easily identify with a patient who rebels against the treatment, the doctors, and the nursing staff. These identification tendencies, then, are not always therapeutically helpful; they can also have a negative effect. Especially when a therapist is inexperienced, there is the danger that the complaining type of patient may find a platform beyond his wildest hopes and succeed in manipulating an entire ward into a negative attitude towards the therapist and the hospital as a whole. In these groups the participants’ feelings towards their parents, siblings, or school fellows are reanimated. The therapist will soon be able to recognize the origin of their propensities, but those concerned will achieve this only after detailed discussion of their attitudes and behavior in the group. A single woman of twenty-three suffered from an infantile neurosis. A domineering mother had prevented her development, and her father had shown little interest in her upbringing. She suddenly declared that the therapist was exactly like her mother; he had pointed out to her beforehand in an individual interview that it was no use trying to change her mother and that she would have to alter her own attitude. When the others drew her attention to the fact that her notion that the therapist resembled her mother was absurd and probably an illusion stemming from her earlier experiences, she began to recognize the transference situation in her feelings towards the doctor and also to realize that she had to run her own life and not continue to accuse her mother while remaining as dependent on her as ever. It was perhaps characteristic of the identification tendencies in the group that another neurotic woman of thirty-two, divorced and also extremely infantile, who also had grown up with a tyrannical mother and a father who took little part in her upbringing, now said that she too saw in the doctor a reflection of her over-strict mother. Doubtless the emergence of the memory image led her to see her mother for the present only as hard and cruel. Meanwhile it was a valuable experience for her to come to grips with the image of her mother, in the transference situation possible in a therapeutic group, and to detach herself from it at least to some extent. Group psychotherapy, even with a large number of patients, not only is quicker to bring out feelings rooted in the past, but often leads to abnormal behavior being recognized as such more quickly than with individual treatment. The criticism of a group of patients is often considerably more caustic than that of an individual therapist. This has the advantage that the patients become aware of their offenses. But it is sometimes traumatic for them to be very sharply attacked. Before long, relationships of many kinds and on many levels begin to appear in these groups, and the patients begin to influence each other. Even those who are not active, but simply listen in silence, are drawn into the group and can share in the anxieties and worries of the other members. It is often a help to recognize problems similar to their own in other patients. Individuals are drawn into a network of interactions and thus freed from the loneliness and isolation attendant on mental illness, at least as long as the sessions last. Even the fact that group psychotherapy requires the presence of the whole ward brings them out of their isolation and into society. Melancholies and involutional depressives in particular—whose illness brings with it a feeling of exclusion from real life, and who suffer from delusions of guilt, poverty, or disease—often, it is true, do not show any substantial lightening of mood; but they are usually helped and relieved by the sympathy of the other participants. Although they may perhaps be unable to express their relief in words, it is still possible to see that sharing their misery with the others brings considerable alleviation of their sufferings. These large groups, in which the patients influence each other in so many ways, possess a “reality intensity” which prevents emotional inhibition. At one time schizophrenics deteriorated not only by the natural progress of their disease, but also because of the unreal, uneventful, torpid atmosphere of a hospital. Group therapy makes the mentally sick individual try to communicate instead of retreating into himself. The individual thus becomes aware of his fellow beings and emotional defect is prevented. As the members of the group become aware of human relationships and show interest in their fellow patients, the wards gain a cohesion, otherwise rarely found, which makes it possible to leave the buildings unlocked. Psychotics and other patients abscond from the hospital much less often than before. The reality of the group obviously exercises a fascination over them, and they are so attracted or absorbed by it that often they can scarcely bear to leave the group and feel very lonely if they have to. Using the hospital ward for group therapy, we can see what position a patient holds in the group. It soon becomes obvious, without any special sociometric tests, how great a combination of emotional attractions and repulsions the various members represent. Similarly, we can very soon recognize the hierarchy of a group. In a well-constituted group, of course, the structure is constantly being modified. On the whole we can agree with Schindler’s division into positions from alpha to omega (1961), although he does not take sufficiently into account the dynamics of a group and the fact that the hierarchic position of individuals is usually not fixed. However, if a patient remains in one position, he runs the risk at least of persisting in a certain attitude, thus decreasing his chances of developing therapeutically effective insights and experiencing changes. Sometimes there is danger to the group as well; prestige-seeking and complaining individuals can easily monopolize the discussion. In this way, especially if the therapist is inexperienced and supports their behavior by his uncertainty, they can attain a leading position from which they cannot be deposed except by excluding them from the group. There is a risk that the group will fall completely under the influence of a monopolist of this type and do only what he wants. The needs of individuals are no longer of any importance, only the demands of one pushing member. The danger is then that from being a well-structured circle, differentiated according to individual needs, and close knit both emotionally and intellectually, the group may become unstructured, its members linked only by feeling and instinct, a “mob in miniature” (Battegay, 1963). In our hospital we have repeatedly seen the group degenerate into a mob, especially where the therapist was still inexperienced. This not only brought the patients no therapeutic gain, but usually caused them positive harm, because their mob behavior, which made them carry out blindly what the monopolist required of them or left them simply bewildered and disorientated, awoke fresh guilt feelings in them. Such things could naturally happen also in wards in which no group psychotherapy work was done. For that reason the patients in one ward should not be mixed indiscriminately, since, without the control of a doctor experienced in social behavior, “mob characteristics” might appear. Nevertheless, this change to mob behavior occurs extremely rarely in psychiatric teaching hospitals, in which, unfortunately, social processes are still very little studied. It cannot be mere chance that such a situation arose only after group psychotherapy had been carried out with a whole ward for at least a year. The group organization can give the patient in quest of leadership a platform which he would not otherwise have had. Certainly this platform is unrestrictedly open to him only when the therapist fails to take the situation in hand—or even smooths the way for him. If we now consider the general impression given by a ward to the whole of which group psychotherapy is applied, we realize that with this (additional) method the patients can be diagnosed and treated much more intensively than without it. They feel much more responsible, in the group, for themselves and for the others, so that they do not passively submit themselves to therapy but take a more or less active part in the treatment.